I added some simple ankle skinny jeans, similar to the denim by Buffalo by David Bitton, and this gorgeous minty lace blouse I scored for only $7! I looove this mint outfit! You always find such great deals! I'd love to go shopping with you sometime! $7? What a good deal! Super cute outfit! The blouse and shoes are phenomenal. Great buys! I am so stoked because we JUST got an H&M last year. Can't wait to go again! Love those sandals! Can't believe they are from H&M!! Love this ensemble! It kind of matches your blog. :) Pretty hair, btw – I wish mine looked like that! I am in love with your outfit! 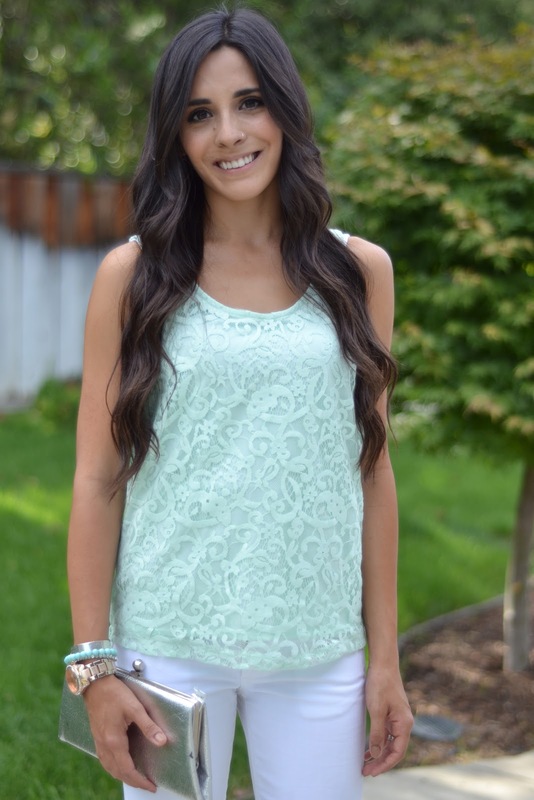 Love that mint lace shirt! Those are from H&M!?!?! Good find!